This is a work in progress. Check back for updates, more video clips of outrageous comments from trail elitists, and voices of reason from CORBA members and other cyclists. A City of Los Angeles ordinance outlaws the use of bicycles on trails and dirt roads within its 469 square mile jurisdiction. December 21, 2009: Use our online form to send emails to petition for off-road bicycling in LA City parks! The comment period ends January 8, 2010, so fill out this form to get your comments in now! Today we received a copy of a letter from Rorie Skei, Chief Deputy Director of the Santa Monica Mountains Conservancy, addressed to Mary Benson and Nina Royal, opinionist and editor, respectively, of the North Valley Reporter. The letter denies claims made by Ms. Benson in her article "Local Activists Kick Consultants to the Curb." The letter is reproduced here, and you can download the PDF for viewing. Your article in the November 2009 North Valley Reporter, "Local Activists Kick Consultants to the Curb," recounts the controversy over bicycles in Los Angeles City parks. In remarks made within the article, an inaccuracy has unfortunately been perpetuated regarding the original Proposition K grant to the Santa Monica Mountains Conservancy and Mountains Recreation and Conservation Authority (MRCA) for the year 2000 purchase of a portion of a 239-acre Mandeville Canyon ownership in the Santa Monica Mountains. The seller was Burt Boeckman, and a tract map was under City review for development of the site at the time. In short, no Prop K funds from that grant nor any other funds were disbursed to the Concerned Off-Road Bicyclists Association (CORBA). That group was not a signatory to the grant agreement and should not be saddled with an allegation that they "... failed to honor their commitment," where there was never any such obligation upon the organization. Background Facts: The original vision outlined in the 1997 grant application was indeed for up to $50,000 of the grant to be used by the Hollywood YMCA for an Adventure Trails youth bicycle program that would buy bicycles and provide for a storage facility on the property acquired for parkland. The Conservancy and MRCA prepared the acquisition grant application on behalf of the City of Los Angeles, in a joint effort to purchase the Boeckman property for open space and recreation, fully in keeping with the grant provisions of Prop K. Although we applied for up to $5 million in Prop K, the eventual granted amount was about half, with the other half matched by the Santa Monica Mountains Conservancy. The City did get its money's worth: it now owns in fee the trail access parcel for which the grant was made, with the purchase price based upon an approved appraisal, and a festering land use controversy was solved to the benefit of the environment and the public. The Conservancy, using $2.234 million dollars in State of California funds for its match, facilitated the purchase of the remaining acreage by the Mountains Recreation and Conservation Authority, thus protecting a premier urban interface open space and wilderness gateway, available for hiking, horseback riding, and yes, mountain bicycling by thousands of users every year, including many families and kids. MRCA rangers patrol and maintain the lands. The property provides the key Westside trail access and critical viewshed to the larger 1400-acre MRCA-owned Westridge Canyon Back Wilderness Park, and contributes to the "Big Wild," the 20,000+-acre core habitat including and surrounding Topanga State Park. The Prop K grant did not provide guarantees for maintaining ongoing programming. Subsequent budget downturns affected all parties: Neither the Hollywood YMCA nor MRCA were able to subsidize and sustain with their own funds the ongoing staffing and interpretive program elements necessary to go forward with and maintain the original Adventure Trails program. Adventure Trails is no longer a program of the Hollywood YMCA to our knowledge. To reiterate, no city dollars were disbursed to the Conservancy or MRcAfor this bike program, and, and certainly nofund5~ nor any obligation to provide services, transferred to COREA. All the initial planning and early trips were completely subsidized by the MRCA, with no Prop K reimbursement. While we understand that there are strong feelings about the City trails controversy, I do trust that this letter will obviate any misconception or rumor about the appropriateness of Prop K funds used to buy and transfer to the City of Los Angeles the beautiful parkland in Mandeville Canyon. Certainly the ongoing popularity of its well-used trails by all ages is a testament to the effectiveness of Prop K in creating parkland and recreational opportunities for all. Certain individuals who are determined to keep off-pavement bicycle riding out of L.A. city parks have been speaking and publishing a lot of hearsay about mountain bikers and CORBA to attempt to sway public and City officials' opinions. A recent article in the North Valley Reporter by Mary Benson, Vice President of the Sun Valley Neighborhood Council, exemplifies such rubbish. Benson’s November 2009 article titled "Local Activists Kick Consultants to the Curb," makes numerous incorrect claims. Here is CORBA's response. Claim: the City of LA purchased Mandeville Canyon Park as a mountain bike park. Fact: the land was purchased for open space preservation and parkland, not as a bicycling "pilot program." The city purchased the land (aka the Boeckmann property) after a 20-year battle led by the Brentwood Hills Homeowners Association to protect the property from development. (See the BHHA newsletter describing the acquisition.) It was widely supported by the local community with petitions signed by 11,000 people. CORBA was not a party to the Boeckmann property acquisition agreement and has never had a contract with the City regarding this property or any other for that matter. Furthermore, the "mountain bike park" that Benson mentions is actually a mere 200-300 linear yard segment of Westridge Fire Road which bicyclists have used for 30 years. It is about two minutes of pedaling, not a "bike park" by any means. The suggestion that the City spent $5 million as a pilot program for mountain biking grossly obscures the truth, perhaps to forward an agenda of prohibiting LA residents from riding bikes on City trails. The majority of the article focuses on such subject matter and discrediting CORBA. For example, Benson states that CORBA promised to provide an "environmental assessment under a CEQA Categorical Exemption." This information is wrong. First, if a project receives a Categorical Exemption under the California Environmental Quality Act, it is exempt from the requirements for preparation of environmental documents. Second, environmental assessments would be prepared by the lead agency or an objective consultant, not a bicycling organization. CORBA did not make such an unfounded promise. Claim: CORBA promised a “Youth Adventures Trails Program” as part of the grant award adopted by the City Council, "no bikes were purchased...and they obviously failed to honor their commitment." Fact: CORBA did not promise to run a youth program at Mandeville and we never received a grant award. As stated above, we were not a party to the land acquisition agreement. We are unaware of which organization, if any, offered to have youth cycling programs at Mandeville. There are similar misstatements by others that CORBA committed to bring 1500 kids per month on youth rides at Mandeville. We find these accusations to be ridiculous and hilarious – as if the homeowners on Westridge Road and vicinity would want their front lawns to be the staging area for 1500 kids and buses (58 kids per day 6 days a week, or 375 each Saturday, for example). Whoever has been to the Westridge trailhead knows that it is a small dirt parking lot that could not accommodate such numbers…the only place to go would be front lawns. CORBA does operate a Youth Adventures program for inner city and at-risk youth twice a month at Malibu Creek State Park, and NPS and Santa Monica Mountains Conservancy parks on multi-use trails shared with hikers and equestrians. Kids spend hours on buses getting to these parks and the transportation is expensive for these youth groups. Holding youth rides closer to the neighborhoods where the kids live would allow more kids to be served, but City ordinances prohibit bicycling on dirt trails. There are numerous City parks well suited for shared-use. With obesity at an all-time high, cycling in all its forms should be embraced as a healthy form of exercise, recreation, and transportation, not outlawed. In 2001, we were asked by the Mountains Recreation Conservation Authority (the agency that now manages the Mandeville land), to hold one of our Youth Adventures rides at Mandeville/Westridge Fire Road. We did, and we found that the venue was not appropriate for our particular program. It may be suitable for other types of youth riding programs, however. Claim: the inclusion of mountain biking in the L.A. Bicycle Plan “diverted resources and energies from the primary goal of bicycling being a real transportation option.” Fact: all forms of bicycling should be included in a Bicycle Plan. Mountain biking is both recreation and transportation, and trails/fire roads can be used for transportation if allowed by the City. Claim: The Osprey Group is a mountain bike advocacy group that recommended parks be open to mountain bikes in violation of City ordinance. Fact: they are professional planning consultants who facilitated discussion and reported on the information presented by participants at meetings. The proceedings can be viewed in Appendix H of the City's draft bike plan. They did not recommend that parks be open to mountain bikes in violation of City ordinance. Claim: Benson states “there are thousands of miles of mountain biking trails within 10 minutes of any City park.” Fact: that's a gross exaggeration. And, it does not negate the idea that LA City Parks should allow some mountain bike use. The highest-risk groups for obesity and gang involvement do not have access to distant riding destinations. Local options are needed. Benson claims that LA City park trails are crowded. Obviously, she has never been on the trails in Aliso Canyon or O'Melveny parks. You can spend hours on these trails and on a busy day, see perhaps a dozen other people. Claim: “Groups like CORBA need to be held accountable for their performance regarding their promises to the City, especially where public funds are spent.” Fact: CORBA made no promises to the City and has never been awarded or received funds from the City. CORBA operates with the highest level of integrity and our community programs enrich the lives of many Los Angelinos – mountain bikers and non-mountain bikers. Individuals who seek to inform the public should check their facts before speaking and publishing misleading and potentially damaging information about others. And, the public needs to always question an author's motives. Multi-use trail systems are common and successful in all jurisdictions surrounding Los Angeles...her reasons for why they cannot work in LA City Parks are unfounded. View the bike plan and send in your comments using our petition. They are due by January 8, 2010! The Mountain Bike Policy Recommendations of the LA Bike Plan (www.LaBikePlan.org) are giant steps backward, not forward, for the mountain biking community. Back in May Alta Planning released the first draft maps for the LA Bike Plan they have been developing for the city for the past 18 months. At the original meetings last year we were promised separate meetings to cover the needs of off-road cyclists, as the meetings we attended focused solely on the urban bike routes, bike lanes and bike paths. Please attend theset public meetings and make your voices as CORBA members and mountain bikers heard. Demand that we be given an opportunity to voice our needs and visions for the off-road portion of the master plan. Those public mountain bike hearings never happened. The draft plan which was released by ALTA was subsequently taken down off the internet (though the original versions can still be found online through other urban cycling advocacy groups such as LA StreetsBlog. They were replaced with watered-down versions that removed more than 100 miles of recommended bike lanes, marked other proposed bike lanes as "infeasible" and essentially gutted much of ALTA's recommendations. So aside from the controversy surrounding the urban components of the draft plan, the Mountain Biking community has been promised much and delivered nothing. Their plan now deems mountain bike policy to be beyond the scope of the plan, and recommends developing a separate trail master plan. "Several policies concerning mountain bicycle access on city trails were adopted by the Los Angeles City Council in the 1996 Bicycle Plan and readopted in 2002 and 2007. Policy 1.3.4 calls for the addition of eight dedicated mountain bicycle trails to be built within the City of Los Angeles. Four of these trails have specific locations: Griffith Park and Ernest Debs Park." While it is beyond the scope of this plan and the current financial means of the City to propose a network of unpaved mountain bicycling paths, the following actions can be undertaken to address multiple user groups’ needs in the City’s limited public park land. 1. Continue to permit mountain bicycling at Mandeville Canyon Park. At present, opportunities for mountain biking in the Los Angeles City Recreation and Park system are limited to Mandeville Canyon. This plan does not support any change in that condition. 2. Pursue opportunities for mountain bicycle access that may exist on land within and adjacent to the City of Los Angeles, under the jurisdiction of other agencies such as the Santa Monica Mountains Conservancy, Los Angeles County, State of California, etc. 3. Assess the viability and future availability of trails for mountain biking. Existing trails in the City of Los Angeles park system should be inventoried and assessed to determine their availability and use for equestrian and hiking activities. 4. Examine other jurisdictions to understand how they accommodate mountain biking and the extent to which conflicts in use, in particular concerns about safety, have been realized and addressed (See Appendix X). Develop a comprehensive database of all unimproved roads including City-owned trails and their allowed uses. Develop a database of all non-City-owned trails within or directly adjacent to the City of Los Angeles where mountain bicycle use is allowed. Conduct user counts on trails in Los Angeles City parks to indicate level of use for different groups. Conduct comparison counts on shared use trails in other urban areas. Research levels of user conflict on shared use trails in urban areas. Identify urban parks where mountain bicycle use is restricted to a limited number of trails, to determine the level of containment (i.e. to what extent does mountain bicycle use spill over onto trails where mountain bikes are prohibited). Identify a subset of trails with no existing equestrian use that may potentially be suitable for mountain biking based on trail width, grade and existing user counts. Obtain information on levels of use by hikers and equestrians before and after the introduction of off-road bicycle access. Develop a citywide master plan of trails for City-owned parks and open space. Report to City Council on environmental impacts of different trail uses. Clearly, this recommendation falls far short of what was outlined in the initial goals of the project, and at the initial public meetings during which the mountain biking community was promised public hearings (none were ever scheduled), and promised an opportunity to have input on greenbelt areas that are city-owned and currently off-limits to bicycles. Respect of all stakeholders and willingness to consider other viewpoint. The invited equestrian representative is an avowed and vocal anti-mountain bike evangelist, who subsequently gloated in their association's newsletter about her success in shutting down the mountain bikers. That person has a history of denouncing and blocking anything to do with mountain bikes at any cost. With statements like "Mountain bikers...present a danger even after they've gone home" (recorded in Appendix H of the draft bike plan), this could hardly be considered a an open-minded person with a willingness to consider other viewpoints. The "mediation strategy" therefore ended in a stalemate with absolutely no outcome other than holding up the process even longer. So instead we ended up with the recommendations in 3.3.1 (reprinted above) that essentially pass the buck entirely, and make no efforts to meet the needs of a large and growing trail user group: mountain bikers. Instead of re-recommending the proposals of 1996 that have never been implemented, we are given even less. The recommendations in 3.3.1 would be a welcome start, if there was any hope of them being completed in a reasonable amount of time. That is a unrealistic expectation, given the city's track record. We can assume that similar research to that recommended in 3.3.1 was done to support the 1996 proposals. Even then a need was found to research at least eight new trails to be opened to bicycles. Since 1996 the mountain biking population has grown. We can only assume that the need for trails for cyclists has also grown. Literature and research is abundantly available on several of the steps outlined in 3.3.1 item 5 of the current draft proposal. Environmental impacts of different trail uses are well-researched and documented. There are ways the City could use existing research and volunteer-driven agencies to complete those steps much more rapidly than if they were to do their own research. We're confident that the need for new trails would then be even more evident than it was in 1996. What is sad about this whole scenario is that Los Angeles is surrounded by some of the best, most under-rated off-road cycling in the country. There is a large variety of terrain, for a large range of skill levels. But most of it is inaccessible to much of the younger and lower income populations who are unable to drive and live geographically distant from the hinterland trails of the Santa Monica Mountains, the San Gabriels, Santa Susanna mountains, and other areas. Local scholastic mountain bike league teams are forced to travel just to train. To have mountain biking opportunities on City-owned properties would help foster a new generation of youths who would be able to head to a more easily accessible city park to hone their skills, improve their health, physical and mental well-being, and, arguably, keep out of trouble. The City of Los Angeles needs to open some of its terrain to mountain bikers, one of the fastest growing trail user groups, for the sake of the community, for the sake of sustainable, health-promoting outdoor activities, and to improve the quality of life of its residents. Presently the City of Los Angeles has one of the poorest records of support for off-road cycling in the nation, if not the world. Los Angeles has not been able to implement a single recommendation of its 1996 plan after thirteen years, and is in fact, proposing to withdraw those recommendations completely. We urge the City to extend the public comment period until at least January 31, 2010 and to hold public meetings specific to mountain bike use on city-owned property as promised. We also urge the City to immediately implement the recommendations of the 1996 plan, and further, to develop a trail master plan utilizing ready and willing volunteer agencies and resources, currently available research from other cities, land owners and jurisdictions, and internationally recognized agencies such as IMBA, to hasten that process. The neighboring Cities of Glendale, Burbank, and Pasadena are already well on their way into that process, and making progress. August 7, 2009: This week in a KABC Ch. 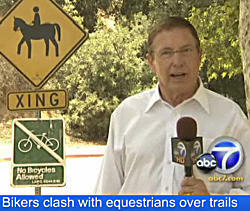 7 interview, Jim Hasenaurer, CORBA founder and former board member, represented the interests of mountain bikers in the controversial ban on bicycle use on trails and dirt roads in Los Angeles city parks. This highlights CORBA's ongoing efforts to gain trail access for mountain bikes in LA city parks. View the video. June 10, 2009: To see the official position of the Sierra Club (Angeles Chapter) on this issue, view this article from the June 2009 edition of the Southern Sierran. May 7, 2009: The City’s Bicycle Plan is currently being updated, and includes a process to assess the inclusion of mountain biking as part of the Plan. On March 27, 2009, LA City Councilmember Tom LaBonge proposed a motion that would continue the ban on mountain biking in Griffith Park, even if trail riding would eventually be considered in other city parks. You can follow the progress of this motion through the online LA City Clerk records. LA city Councilmember Tom LaBonge, when he heard that the Bicycle Plan may be updated to consider opening some LA city park trails to mountain biking, proposed a motion on March 27, 2009 that would continue the ban on mountain biking in Griffith Park, even if it were eventually to be considered in other city parks. You can follow the progress of this motion through the online LA City Clerk records. The LA City Arts, Parks, Health and Aging Committee, which Councilmember LaBonge chairs, considered this motion at a meeting on April 15 (agenda). CORBA members were present at that meeting to argue in favor of allowing the consideration of Griffith Park to any updating of the Bicycle Plan. Equestrians and leaders of the Sierra Club argued that not only should Griffith Park not be considered for mountain biking, but the ban should continue in all LA city parks because it has served them well for many years. CORBA recorded the proceedings and you can view excerpts of the public testimony for yourself. Just click on a thumbnail to start the video. Or, listen to the entire discussion! The videos include text overlays added by CORBA. "Mountain biking is an extreme sport"
"Bicyclists are into speed, thrills, chills, jumps"
"Bicyclists threaten native plants and animals"
"Bicyclist go off trail and trample"
"Bikes are dangerous with horses"
"Bikes are dangerous to all other users"
There is conflict. They see conflict "all the time"
"I'm a bicyclist and a horse rider and when I ride my bike I'm into speed, excitement, thrills and danger"
"These are urban parks with lots of different visitors; bikes aren't compatible"
"There are children in the parks; bikes present a danger"
"Bikes should be restricted to designated areas (and not in city parks)"
Hiking and horse riding has decreased considerably and it's because of bicyclists "taking over the trails"
"There are lots of mountain bike opportunities nearby." "There are lots of road and bike path facilities in LA."